Roberto Alomar was one of the best all-around players of the 1990s, excelling in the field and at the plate, as well as being a constant force in the postseason. Following his 17-year career, Alomar entered the Baseball Hall of Fame in 2011 on his second ballot. 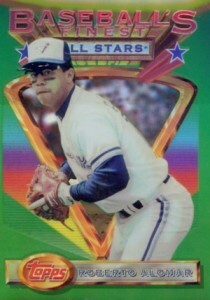 This top list looks at some of the best Roberto Alomar cards available to collectors. Shop for Professionally Graded Roberto Alomar Cards on eBay. 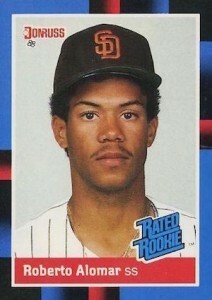 "Robbie" first broke into the majors as a twenty-year-old with the San Diego Padres in 1988. 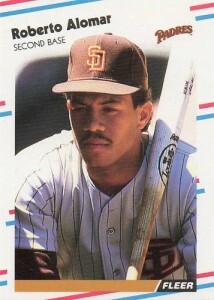 Initially, most in the game knew him for being the brother of fellow Padres prospect Sandy Alomar Jr and the son of former player Sandy Alomar Sr. After being traded to the Blue Jays, Roberto Alomar came into his own, helping lead the team to consecutive World Series titles in 1992 and 1993. A well-traveled player, Alomar also spent time with the Orioles, Indians, Mets, White Sox, and Diamondbacks during his career. As one of the top offensive second basemen of his era, he frequently hit around .300 with plenty of pop in his bat and earned four Silver Slugger awards. Robbie also shined in the field, winning 10 Gold Gloves, which is the current MLB record for second basemen. The first Roberto Alomar baseball cards were produced during the late 1980s at the height of the junk wax era, putting his rookies among the most affordable and plentiful Hall of Fame options collectors can pursue. As a consistent All-Star player on championship-caliber teams, the popularity of his cards continued to increase within the hobby. During the 1990s, at the height of his playing career, Alomar was almost always included on card checklists for the most popular base, insert, memorabilia, and autograph products. The Hall of Fame infielder has remained a favorite with collectors in his retirement. In recent years, Roberto Alomar has been a generous signer in many different baseball card products and also frequently appears as a subject in base and insert sets. Again, due to affordability and availability, his early cards remain popular with collectors of all ages. The following guide looks at ten key Roberto Alomar cards, highlighting notable options from across his Hall of Fame career. While he has many modern options, including a variety of autographs, an emphasis was placed on cards from his active playing career. Click on the titles or images to shop for specific cards on eBay. At the start of their careers, Roberto and Sandy Alomar spent time together playing for the Padres, and, later in their careers, were also teammates with the Cleveland Indians. 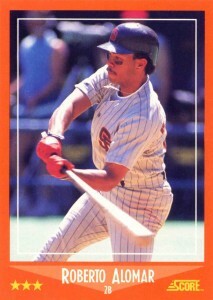 Over this period, several cards were made featuring both Alomar brothers. The majority of these cards can be found in late 1980s and early 1990s junk wax sets. One of the most popular cards featuring the Alomar brothers comes from 1992 Upper Deck. 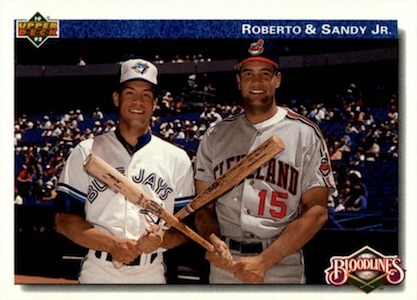 While Roberto and Sandy were not teammates when this card was produced, many fans best identify Roberto with the Blue Jays and Sandy with the Indians. Collectors looking for a challenging card featuring the duo can try to track down a copy of their 1998 Stadium Club Co-Signers Autograph. 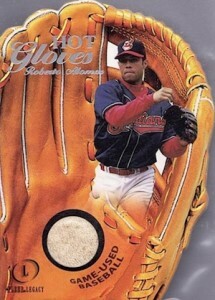 One of the finest defensive players in the history of the game, Roberto Alomar was a natural pick for Fleer to feature in their Hot Gloves insert set. Fleer originally produced these die-cuts for their Flair product in the mid 1990s, but moved the popular insert around to other brands, such as Fleer Legacy and Showcase, after discontinuing the Flair products. The 2001 version of the Hot Gloves insert does not contain player-specific items, as all cards feature game-used baseball relics, but this is easily one of the most popular versions of the Hot Gloves line. One catchy feature is the inclusion of the actual game date when the ball was used on the back of the card. Roberto Alomar's first appearance in a Fleer product came in the company's Update product, which was sold as a complete factory set. The set includes the rookie cards of John Smoltz and Craig Biggio, and this Alomar rookie card is one that can be picked up for next to nothing. There is also a Glossy version of this rookie card, only distributed in factory sets, that was limited to 60,000 copies. The two versions of the card feature the same design, but the Glossy version has a smooth sheen over the picture on the front. Alomar's 1988 Donruss card is another inexpensive and readily available rookie for the HOF second baseman. Of his four major rookie cards, Donruss was the only manufacturer to feature him in their main base set. The rest of the other Roberto Alomar rookie cards were all found in update sets. Like any good rookie card from a 1980s Donruss set, the Alomar card is graced with the Rated Rookie logo in the bottom corner. 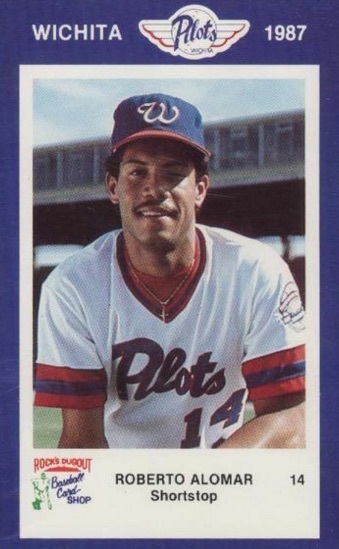 One of the more unique Roberto Alomar cards comes from his time spent playing for the Wichita Pilots in the Texas League. Although he was featured on several minor league cards, this team-issued card, sponsored by a local card shop, is a favorite amongst his card collectors. Copies of the card are not too hard to track down, but they can be a little pricer than other early Alomar cards and high-graded copies definitely carry a premium. Collectors can also work on piecing together the complete team set that also included his brother Sandy as the team's catcher. 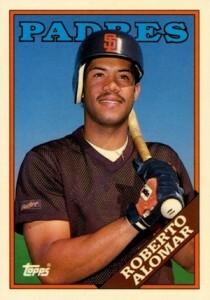 1988 Topps Traded is anchored by the Roberto Alomar rookie card. While there are many other nice rookie cards in the set, such as Mark Grace and Tino Martinez, the Roberto Alomar card is currently the lone Hall of Fame rookie card appearing in this product. Topps also issued a Tiffany version of this card featuring a glossy finish. Both versions of the Alomar Topps Traded rookie were originally distributed in factory sets. Donruss Elite was one of the more popular insert sets of the 1990s. Elite first appeared in the 1991 Donruss set and the insert was serial numbered to 10,000 copies. Given the popularity of the originals, Donruss continued the Elite set past the initial offering into their 1992, 1993, and 1994 sets. In spite of the higher print run, Alomar's Elite card is a favorite for his collectors. The foil front makes this especially popular with graded card enthusiasts. One thing to note is that this card is often confused with his Donruss Elite Dominators insert card from the same year. Unlike the Elite cards, which could be found in packs, the Elite Dominators were sold on television via the Shop at Home Network and attached to a hobby box of 1993 Donruss cards. Another in-demand 1990s baseball card set featuring a notable chase card of Roberto Alomar was 1993 Topps Finest. The first Finest set issued by Topps was highlighted by the inclusion of parallel Refractors. The odds of pulling a Refractor were not necessarily steep, but Topps did have a limited production run of Finest, making roughly 250 copies of each reflective parallel card. 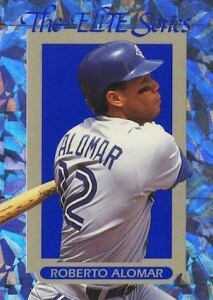 Alomar's Finest Refractor is considered his one of his most sought-after cards and is also one his pricier options. Similar to the Donruss Elite cards, the Finest Refractors are regularly submitted for grading, further increasing prices. Roberto Alomar's first certified autograph appeared in the 1996 Leaf Signature set. This was the first major per-pack autograph product on the market and has remained extremely popular with collectors. 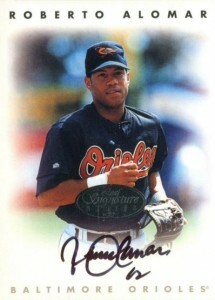 Alomar's autograph appeared in the first production run — there is also an extended set — and was one of the short printed autographs. By today's standards, the limited run of 1,000 copies seems generous, but copies of this card can be tricky to find at times. While Alomar has been a generous signer in many card products produced after his retirement, autographs from his playing days remain noteworthy to collectors. The overall favorite for Roberto Alomar rookie cards comes from 1988 Score Rookie/Traded. While this set is widely available and not overly expensive, the product was Score's first attempt at making an update product and the print runs were smaller than the other sets featuring rookie cards of Roberto Alomar. The set also features the rookie card of fellow Hall of Famer Craig Biggio. Easily recognizable thanks to the orange frame, this design kept the product in line with other Score sets, which also used colorful borders. In addition to the base, Alomar's Score Rookie/Traded card can be found in a Glossy version, similar to Topps Tiffany, which command a premium. 2 Lot 2003 Timeless Treasure Patch Auto Joe Carter Roberto Alomar Multi Color!